This post is sponsored by our friends at Roxbury Mountain Maple! We absolutely love their naturally sweetened, great selection of all things maple and we know that you will too! I’ve squeezed everything I can out of summer, but I have to be honest I’m totally ready for the next season. It could be because these apple cider donuts with maple cream frosting just kind of draw it out of you. But that’s kind of the way I am, thankful for the season and ready and prepared for the change. Because everything in life changes so we might as well grasp each moment and live fully in whatever season of life it is. That’s better than the alternative of being miserable nine months out of the year waiting for summer, right? But easier said than done. So, maybe you’re someone who needs a little coaxing to get ready for the next season. You know, a cool breeze, cloudy days, spice scented candles, and all things apples. Then why don’t you fix your gaze on these donuts. 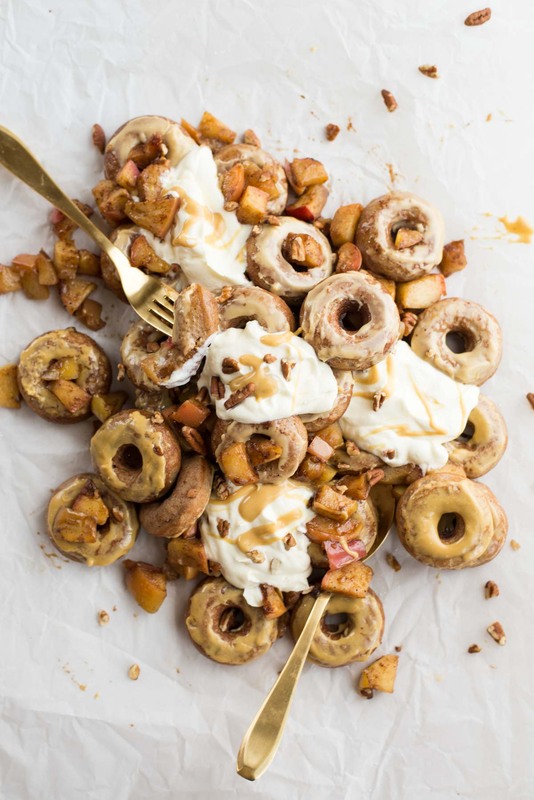 The spiced cinnamon and nutmeg combined with apple cider in freshly baked donuts topped with maple cream glaze. Are you getting excited now? 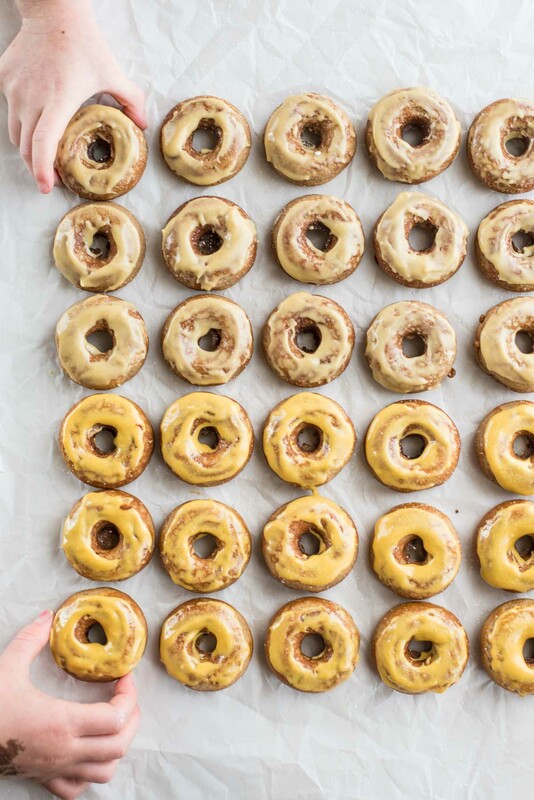 I can assure you these donuts are spot on fall perfection and more than that I can assure you that maple cream from Roxbury Mountain Maple is better than any frosting you could eat. We literally have to put it up in the high cabinet in our house because we may or may not have found our children closet eating it. Like literally sitting in a closet spooning it into their mouths. But who am I to blame, that stuff is good! I’ve even thought up a million and one ways to use the maple cream, including spooning it right into your mouth, but I have to say that this one here may be the best one. The reason, it leaves it pure in its crazy delicious form. It’s like the maple cream was perfectly created just for these donuts (okay and maybe your taste buds). But seriously, a no-make frosting that is free of artificial ingredients and made with one of the two healthiest sweeteners on earth, maple syrup. I’m not here to argue sugar in this post but what I am saying is that if you eat sugar, like we all do on occasion, the healthiest of them all will be maple syrup and honey. Why? Because just like any food those grown from the earth, real, wholesome foods, like this maple syrup tapped straight from a Maple tree is much better than anything that comes from a factory. Of course as always quality matters more than anything and thus why I’ve fallen head over heels in love with Roxbury Mountain Maple. There are a lot of reasons they are my go-to maple people. One, because I get small agriculture and family farms and do my best to support them. Two, because the quality of their products is some of the best I’ve experienced. And three, the flavor is beyond explanation and that may be reason enough. The apple cider donuts in this recipe have been sweetened alone with maple syrup and topped with the maple cream. A little syrup goes a long ways because of the bold flavor making these donuts lower in sugar than most donut recipes around. I can assure you you’re going to want to make this one today. 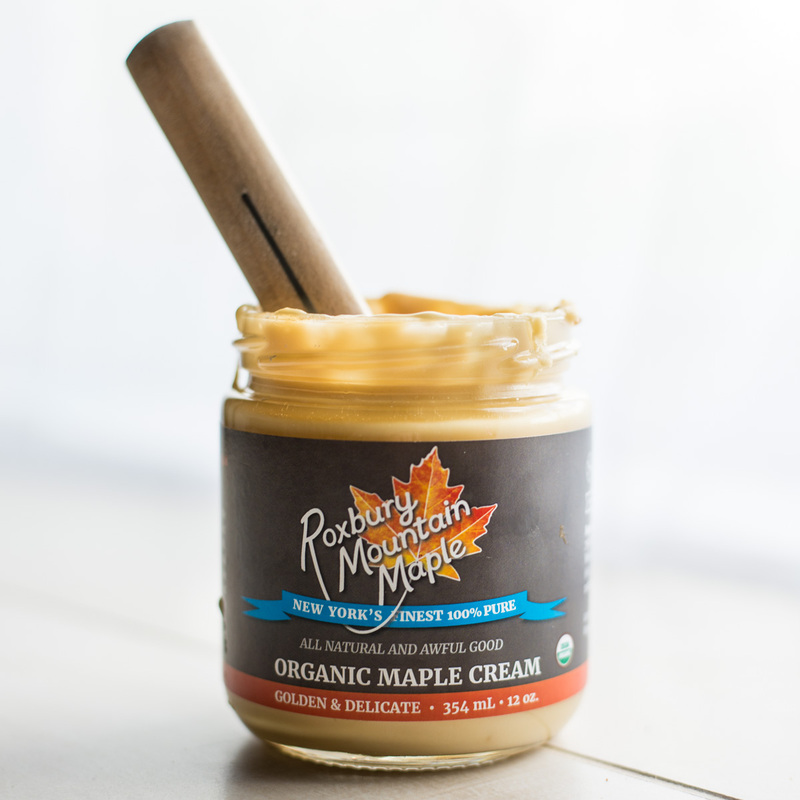 Just because the family owned Roxbury Mountain Maple farm would like you all to experience the wonders of their maple products including the maple cream, they are giving you this discount code, maple916, for a 25% discount on your purchase from them on Amazon. Click here to visit their products on Amazon to collect your discount. Just to give you a little heads up on their products. They recently came out with a strong and dark maple cream to go alongside the light and golden maple cream. The strong and dark obviously has a more prominent maple flavor and you could probably get away with using less. But both are honestly delicious. And if I had to convince you to buy one more thing from them, it would be the maple sugar, the granulated form of syrup. 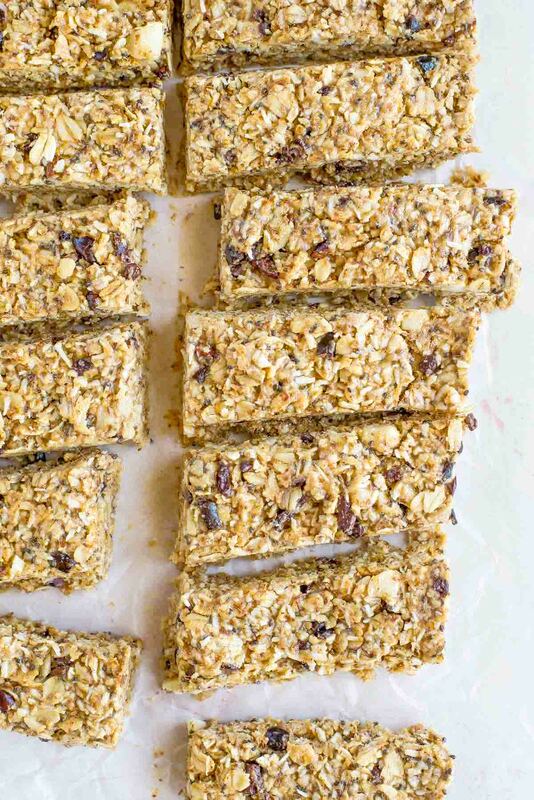 We use this all of the time (and that’s not an exaggeration), especially in the Quick and Easy Cinnamon Muesli. Oh who am I kidding, get one of everything! You’ll always use it and you won’t be disappointed. 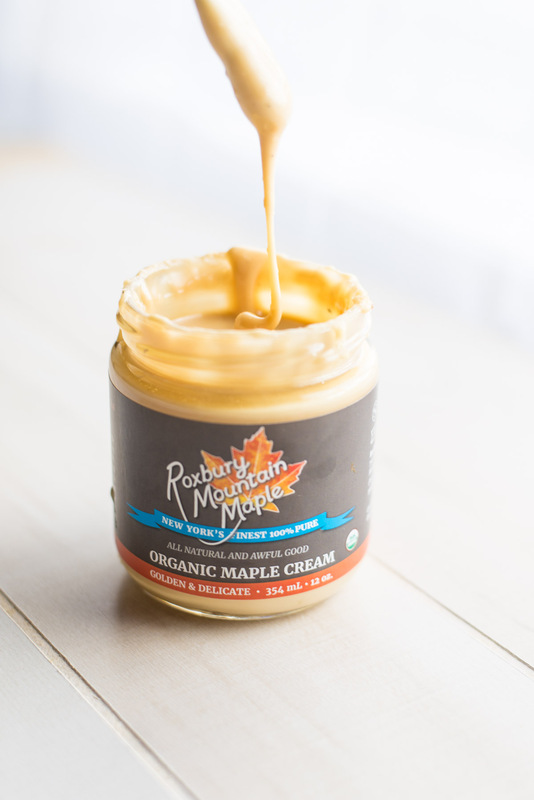 Because the Roxbury Mountain Maple family is so amazing, not only are they giving you 25% off an order but they are also doing a giveaway for a chance to win your own 1 pound bottle of maple cream and some maple syrup to go along with it. Snag a chance to win here. All you need to do is visit the link below, enter your email address and confirm your entry, we’ll pick a winner next week to get these amazing maple products! The coolest part? We’ll be sending you your very own “Lucky URL” that you can share with your friends. For each friend that signs up, you’ll get three extra entries into the drawing. The more you share, the better your chances to win, pretty sweet, right!?! 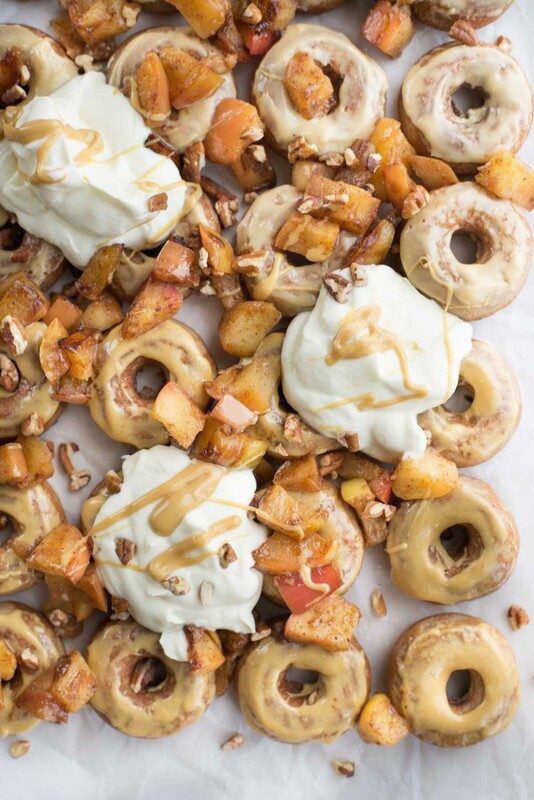 If you’re feeling frisky you can trash out your apple cider donuts with maple cream and add sautéed apples, whipped cream and pecans. Because life is worth living… am I right? Don’t have a donut maker? I highly recommend getting one! 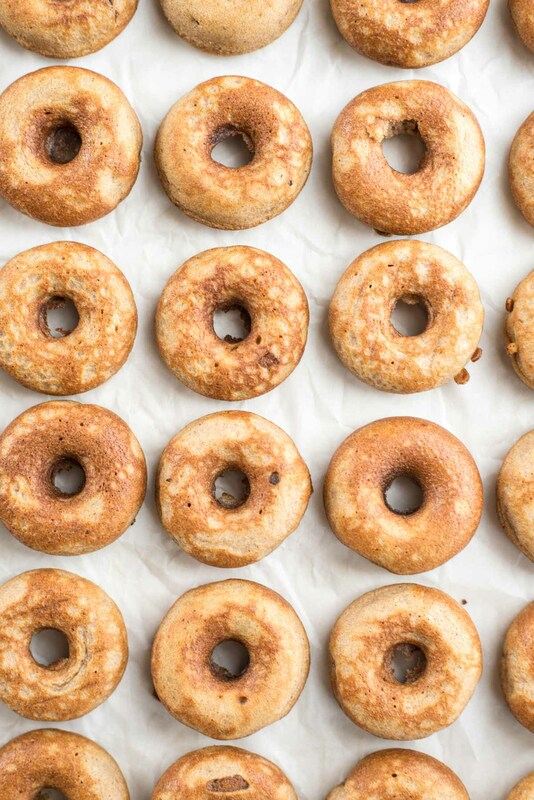 You can also bake them in a donut pan (or a mini muffin tin for a donut hole feel) in the oven at 350 degrees for 15 minutes. 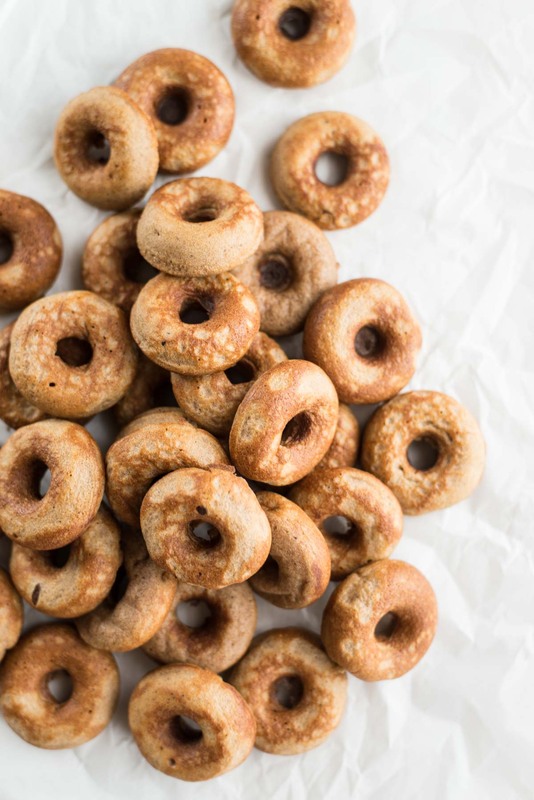 But if you do want to invest in a low-cost donut maker, it is definitely worth the money considering it is inexpensive and you’ll use it for many years. This is the donut maker I love. Heat donut maker (or preheat oven to 350 degrees). In a small bowl, melt coconut oil (or butter), let cool slightly and slowly add in apple cider. Add the eggs, vanilla, and sugar, whisk to combine. Add wet ingredients to dry until incorporated. 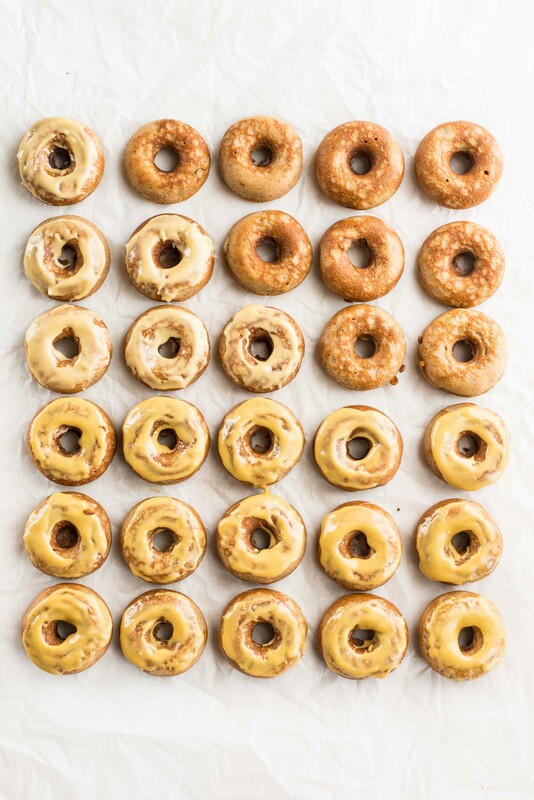 Place a tablespoon of batter into each donut hole and cook until golden. (If baking bake for 350 degrees). Remove, let cool and top with a thin layer of maple cream. « Episode #029: Is Snacking Healthy? Episode #029: Is Snacking Healthy?